This new project is an ample, courageous discography released on the 4th of January 2019 under the Swiss record label, Tudor. The Bamberg Symphony Orchestra's 50th album under the Tudor label is also the first one in a series of four. It intends to draw a parallel between Brahms' German symphonic style and Antonin Dvorak's. The two composers, who were both great figures of the Romantic Period, may have come from different geographical places, but the Bamberg Symphony Orchestra musicians' goal is to highlight Brahms' and Dvorak's lifelong admiration for one another. "Brahms and Dvorak have been a great influence for both myself and the Bamberg Orchestra. In fact, they somehow created a bond between the German Orchestra and me - a Czech conductor; it is a connection that carries a lot of history", said Jakub Hrusa, the 37 year old conductor. The idea of this album is to put Johannes Brahms' four symphonies and the last four Antonin Dvorak symphonies (also the most renowned) face to face. 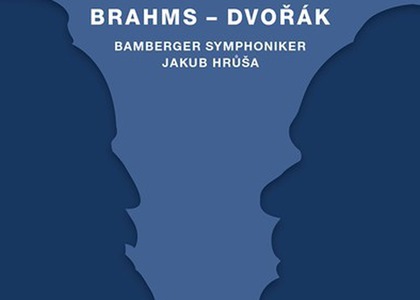 But the journey is an inverted one, because on January 4th the series kicked off with the recording of the last Brahms and Dvorak symphonies, namely Symphony No. 4 and Symphony No. 9, From the New World. The protagonists - the Bamberg Orchestra and Jakub Hrusa - do not intend to revolutionize the interpretation of the two opposites. They wish to stimulate the audience through surprising experiences and convince the listeners to dive into a journey where they can discover the similarities between these pieces (like the fact that they had both been written in E minor); but their utmost wish is to show the world the uniqueness of these Romantic masterpieces. I consider this to be interesting, the fact that the musicians manage to bring themselves closer to their objective by performing Brahms and Dvorak with a quasi-similar interpretative attitude. The result is a poignant, but not too rough version of these symphonies, full of arched tempos and phrases in which every instrument and section of the orchestra is highlighted with great precision during the score's key moments. Brahms' Symphony No. 4 and Antonin Dvorak's Symphony No. 9 performed by the Bamberg Symphony Orchestra and conducted by Jakub Hrusa will be broadcast on Radio România Muzical on 12th and 19th of January 2019 at 1 p.m.